Introduction (Cullinane and Talley); The Evolution and Challenges of Port Economics (Heaver); An Economic Theory of the Port (Talley); Multiple Outputs in Port Cost Functions (Jara-Diaz, Martinez-Budria and Diaz-Hernandez); Estimating the Relative Efficiency of European Container Ports: A Stochastic Frontier Analysis(Cullinane and Song); The Impact of Port Characteristics on International Maritime Transport Costs (Wilmsmeier, Hoffmann and Sanchez); A Strategic Positioning Analysis for Ports (Haezendonck, Verbeke and Coeck); Port Investment: Profitability, Economic Impact and Financing (Enrico, Claudio and Marco); Shipping Deregulation’s Wage Effect on Low and High Wage Dockworkers (Peoples, Talley and Thanabordeekij). A port (or seaport) is a place that provides for the vessel transfer of cargo and passengers to and from waterways and shores. Port economics is concerned with the study of the economics of port services. Users of port services are those that utilize the port as part of the transportation process of moving cargo and passengers to and from origin and destination locations. Users include transportation carrriers such as shipping lines, railroads and trucking firms that perform these movements and shippers and individuals that provide the cargo and themselves as passengers to be transported. Port users demand port services, whereas port service providers such as the port terminal operator supply port services to port users. Port economics and shipping economics comprise the branch of economics known as maritime economics. 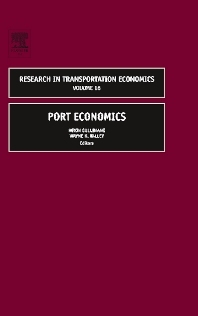 This volume provides original contributions to the study of port economics: 1) the evolution of port economics; 2) economic theories of the port, port cost functions and port investment; and 3) empirical evidence on the relative efficiency of ports, the impact of ports on international maritime transport costs, the competitiveness of ports and the impact of deregulation on dockworker wages. Professor Kevin Cullinane is Chair in Marine Transport & Management at the University of Newcastle in the U.K. He was previously Professor and Head of the Department of Shipping & Transport Logistics at the Hong Kong Polytechnic University, Head of the Centre for International Shipping & Transport at Plymouth University, Senior Partner in his own transport consultancy company and Research Fellow at the University of Oxford Transport Studies Unit. He is a Fellow of the Chartered Institute of Logistics & Transport and has been a transport adviser to the governments of Hong Kong, Egypt, Chile and the U.K. He holds visiting Professorships at a number of institutions and an Honorary Professorship at the University of Hong Kong. Maritime Institute, Old Dominion University, Norfolk, VA, U.S.A.